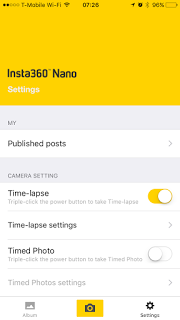 A firmware and app update for Insta360 Nano added a true HDR mode, a time lapse mode, and other features. Now there is a true HDR mode that will allow the Nano to capture a much wider dynamic range by taking two shots and combining the exposure. To use HDR, you need the app. Go to shooting mode, tap on the settings icon on the lower right, then tap on the HDR icon. It works best when used with the self-timer. Then press the shutter to take the HDR shots. The app will combine them automatically. Because the HDR mode combines two exposures, the shot can become a little blurred (as in the example above) unless you can use a high quality tripod. The update adds a time lapse video mode. 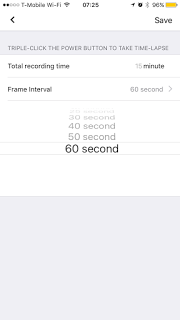 To use this, go to the Settings from the main menu, and turn on Time-Lapse. 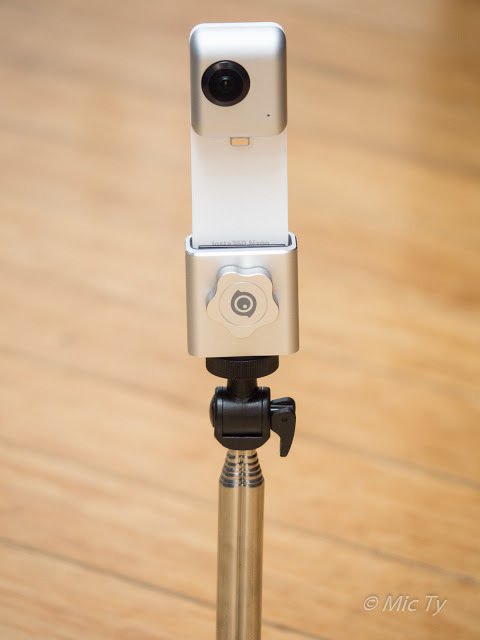 Once you’ve turned on the Time-Lapse, you use it by removing the Nano from the phone, mounting it on a tripod or stable surface, then triple click the shutter button (the same way as you would use the self-timer without the app). Please note that the Time-Lapse mode and Self-Timer are mutually exclusive. Activating one disables the other. Insta360 updated its app so that you can now see your uploads to Insta360’s cloud service. First, register for the cloud service by clicking on Settings from the main menu. The first option is “published posts”. Tap on that then register your email and password. To view your uploads, go to the Settings from the main menu and tap on Published Posts. You’ll see your uploads. Photos uploaded to Insta360’s cloud service can be further shared to Facebook, Twitter, or Facebook Messenger. The update reduces power consumption while shooting, and decreases heat build-up. Updating the app should be automatic. However, if you want to update the app manually, just go to the App Store, search for the Insta360 Nano app, and press update. 2. Go to the camera mode, and tap on settings on the bottom right. 3. Tap on the HDR icon. You’ll be prompted to update the firmware. Just press OK. It will download and install the new firmware automatically. 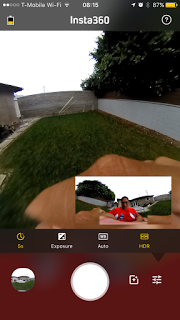 Nikon Keymission 360 image stabilization: does it work?